It you're a dog lover, it may be hard to believe that there's anything that can make a very good boy or very good girl even cuter. But we have one word for you: fluff. It's a scientific fact that some fluff can make literally anything cuter—and doggies are certainly no exception. Trust us. We've conducted the very in-depth, "scientific research." From big, fluffy dogs, like Samoyeds to the tiniest fluffy dogs, like Pomeranians, we've rounded up some of the fluffiest, most adorable pooches out there. Plus, if your furry family member is blessed with some fluff, learn some simple grooming tips that will keep his or her coat clean, healthy, and impossibly fluffy. Poodles are probably best known for their super coifed hairdos—but did you know their unique-looking fluff originally served a very specific purpose? Before Poodles earned an unfounded reputation as being "prissy," they were often used as hunting and duck dogs, due to their strong swimming skills and "soft" mouths. Because they were hopping into freezing cold water to retrieve ducks and birds, their owners would trim their hair in strategic patterns to protect vital body parts from the cold, while reducing the amount of cold, wet fur the Poodle had to carry around. Although Samoyeds are typically known for their super thick, fluffy coats and sweet Sammy smiles, these fluffy dogs aren't all good looks—they have some serious history, too. Originating in Asia, Samoyeds are believed to be one of the world's oldest dog breeds. Although they were originally bred by the Samoyede people of Persia to hunt, herd animals, and pull sleds, they were considered true members of Samoyede families, too. There's definitely no shortage of adorable photos of Chow Chows' fluffy coats. There's also quite a few pictures showing their massive, toothy grins on the internet. So, it only makes sense that Chows would have an abundance of teeth, too. While most dogs have 42 teeth, Chow Chows have 44. That has to be the explanation for their charming smiles, right? 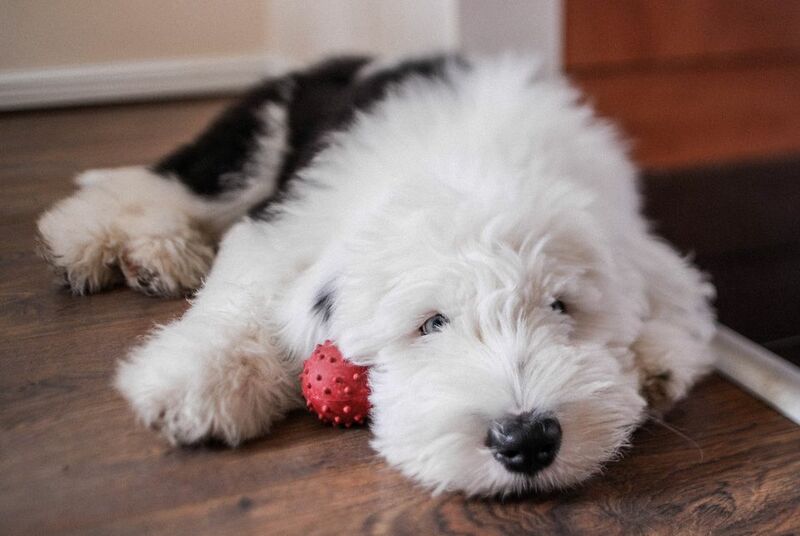 Although Old English Sheepdogs were originally bred as working dogs in southwestern England, they became symbols of wealth when they first arrived in the United States. William Wade, an industrialist from Pittsburgh, first kept Old English Sheepdogs in the 1880s. Then, within 20 years, five of the 10 richest families in the United States owned, bred, and showed Old English Sheepdogs, including the Vanderbilts and Guggenheims. Believe it or not, many Border Collies can trace their ancestry back to a single dog named Old Hemp. Born in 1893, Old Hemp's herding technique was seriously impressive—so impressive, in fact, that cattle ranchers had to propagate his skills. Accordingly, he became a stud dog and fathered over 200 puppies! Today's Pomeranians have a common reputation as being lap pups, tea cup dogs, and even purse pooches—but back in the day, Pomeranians were actually powerful working dogs that were used to herd animals and pull sleds across snowy terrain. Early Pomeranians weighed about 30 pounds, but were bred to a smaller size sometime during the 19th century. Now, most Pomeranians weigh between four and seven pounds. Great Pyrenees were originally bred to guard livestock in Europe's Pyrenees Mountains, but they're incredibly nurturing, gentle dogs—despite their massive size! Because they're so calm and loving, Great Pyrenees are often used as therapy dogs in schools, hospitals, and care facilities. Not only are they super sweet, but they're tall enough to reach the edge of a wheelchair or hospital bed for easier petting. In Tibet, where Lhasa Apsos originated, these fluffy dogs are known as Abso Seng Kye, which translates to "Bark Lion Sentinel Dog." Pretty badass, right? Lhasa Apsos were often charged with guarding the interiors of Tibetan buildings, and would bark to alert their humans of intruders—hence the "bark" and "sentinel" aspects of their name. What's more, Lhasas are linked to the Tibetan Snow Lion, which Tibetans consider the guardian of their country. Affenpinschers, otherwise known as monkey terriers, were named for their extremely unique appearance. But they were given their nickname, diaboltin moustachu—or mustachioed little devil—for their playful nature. It's true that Affenpinschers are super smart, loyal, and curious, but the fact that they're terriers can make them a bit excitable. Boasting an impressive 2,800 year history, Maltese are believed to be another one of the oldest dog breeds. Over the course of those 2,800 years, Maltese have become fan favorites of royalty around the globe. Not only were they cherished by ancient Greek, Roman, and Egyptian royalty, but Queen Elizabeth I and Mary Queen of Scots adored them, too. These days, Maltese are super popular among Hollywood's royalty. It's hard to handle how irresistibly adorable these balls of fluff are. Aside from their impressive coats, Pekingese also have an interesting smushed face—similar to that of Pugs or Shih Tzus. There's actually a name for the variety of pups who share this type of face: brachycephalic dogs. Their shortened airways can lead to possible health problems, but with proper care they can live healthy, happy lives! Despite their massive size, Newfoundland dogs are nothing but fluffy, gentle giants. They're hardworking, kind, and trustworthy. So much so that Lewis and Clark took one on their expedition across the United States. Seaman happened to be a Newfy and helped keep the team fed by hunting animals throughout the trip. It was also believed that he was stolen at one point during the journey, but then later returned. We can't blame whoever took him—these pups are just too cute! When it comes to fluffy dogs, maintaining the cute, fluffiness can come with a price: Fluffy coats require the most maintenance due to their double coats. What's more, if you take your pooch to a professional groomer, trips can add up pretty quickly. Gather your tools. Depending on your dog's coat, you might want to invest in a slicker brush to remove matted hair, a pin brush to brush through her double coat, and a comb to detangle. Then finish by fluffing her coif. Brush her coat every day. Yup, we told you fluffy coats require some serious maintenance. Brushing with a pin brush doesn't just help prevent tangles or matting—it can reduce the amount of fur she sheds, too. Remove mats. You might find mats behind your dog's ears, under her arms, or on her hind legs. Gently comb mats with a slicker brush to detangle. Give her a bath. After a good brushing session, bathe your dog with the right shampoo for her coat- and skin-types. This will remove any excess hair and dander from her skin. Finish with a comb. After your fluffy dog has air dried, finish and fluff her fur with a wide-toothed comb. Remember: If you want to keep your dog's coat beautiful and healthy, stick to your daily brushing and grooming schedule. Not only will it prevent mats and tangles, but it'll save you some cash at the groomer, too!